Friday March 6th 1896 I did cake baking and churning this morning. Had dinner before noon and Will and I went to town. I spent the afternoon over the river. The girls got home from Des Moines last night. Mother gave me more pieces for my rug. I read all the evening. Saturday March 7th 1896 Will waled down town. I finished the last rug before noon. I have made two new ones that were very large and finished out two small ones I had. I ripped up old dressed for quilts and cut carpet rugs till bed-time. 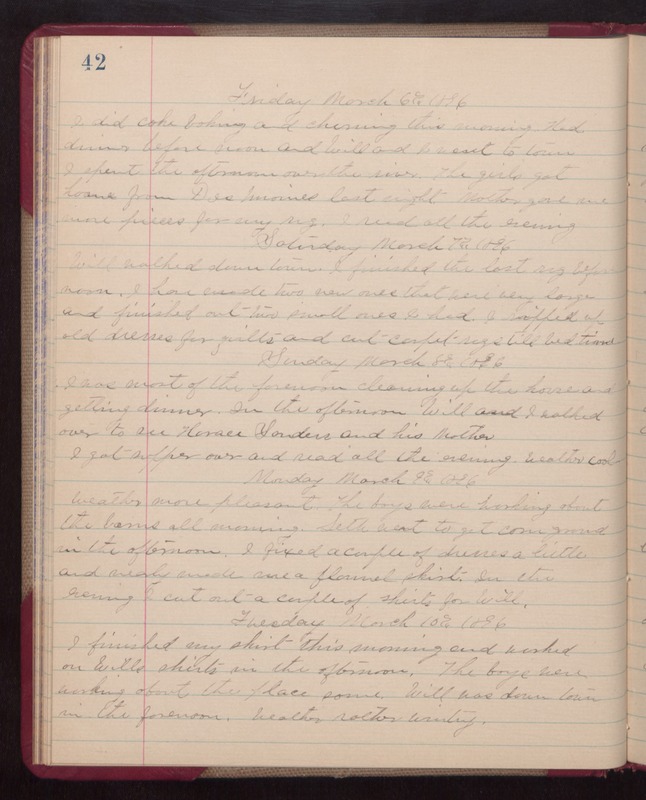 Sunday March 8th 1896 I was most of the forenoon cleaning up the house and getting dinner. In the afternoon Will and I walked over to see Horace Sanders and is mother. I got supper over and red all the evening. weather cool. Monday March 9th 1896 weather more pleasant. The boys were working about the barns all morning. Seth went to get corn ground in the afternoon. I fixed a couple of dresses a little and nearly made me a flannel skirt. In the evening I cut out a couple of shirts for Will. Tuesday March 10th 1896 I finished my skirt this morning and worked on Wills shirts in the afternoon. The boys were working about the place some. Will was down town in the forenoon. weather rather wintry.